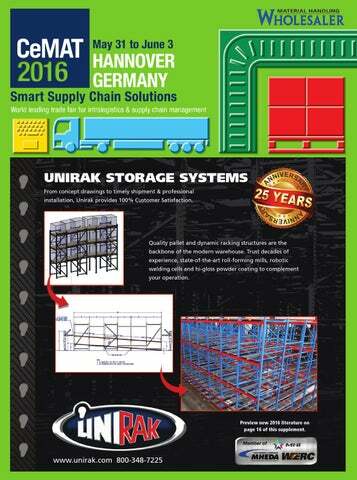 UNIRAK STORAGE SYSTEMS UNIRAK STORAGE SYSTEMS concept drawings to timely shipment & professional FromFrom concept drawings to timely shipment & professional installation, Unirak provides 100% Customer Satisfaction. installation, Unirak provides 100% Customer Satisfaction. Quality pallet and dynamic racking structures are the Quality pallet and dynamic racking structures are the backbone of the modern warehouse. Trust decades backbone of the modern warehouse. Trust decades of of experience, state-of-the-art roll-forming robotic experience, state-of-the-art roll-forming mills,mills, robotic welding cells and hi-gloss powder coating to complement welding cells and hi-gloss powder coating to complement operation. youryour operation. Preview new literature 2016 literature Preview new 2016 on on this supplement. page page 16 of 31 thisofsupplement. autonomous vehicles and innovative industrial trucks to new rack systems, collaborative robots and state-of-the-art integrated IT systems. Solid growth projected for intralogistics technology The intralogistics industry is on a steady growth trajectory. Last year, manufacturers of intralogistics solutions in Germany alone produced 20.1 billion euros worth of equipment – up three percent on the previous year. 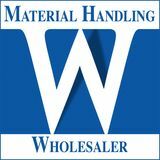 Germany’s VDMA Materials Handling and Intralogistics Association forecasts similar growth for the current year. “These sorts of growth figures are underpinned by the positive development of Europe’s Common Market. The positive performance of some target industries around the world has also been instrumental in keeping manufacturers’ order books full. eCommerce and the automotive industry are key examples of this,” explained the association’s President, Sascha Schmel. New “Logistics IT” showcase Software is becoming an increasingly important part of the intralogistics market. In recognition of this, CeMAT’s organizers have created a new, dedicated display area for all the latest logistics software applications – the Logistics IT in Hall 27. “Smart IT solutions are fundamental to modern logistics. IT is now the number one driver and source of innovation in logistics. Developments like mobile Internet and the digital integration of all end-users into the production and supply chain are opening up new opportunities and giving rise to new business models,” remarked Gruchow. It is only fitting then, that SAP, the world’s leading enterprise software company, should be exhibiting at CeMAT. SAP and six partner companies will debut at the show with their latest industry solutions in the Logistics IT display area. Their pavilion will be themed “Integrated Logistics”. handling equipment. As well as presenting these sorts of machines and equipment, the showcase will explore ways in which they can be intelligently integrated into automated supply chains. Another highlight of the new showcase will be the Logistics IT and Automation Forum. There, IT experts and users will discuss a wide range of topics, including the role of the cloud in logistics, mobile solutions, interfaces and integration, intelligent tracking and tracing, network planning/supply chain design, big data in logistics, WMS, image processing in logistics, and virtualization. Cranes and Lifting Equipment Pavilion Like other core areas of the logistics industry, the cranes and lifting equipment sector faces major challenges from the growing trend towards digital integration and Industry 4.0. In recognition of this, the sector will have its own dedicated exhibition area at the upcoming show: the Cranes and Lifting Equipment Pavilion in Hall 27. CeMAT ranks among the world’s most important trade fairs for cranes and lifting equipment. The exhibits will range from simple load handling attachments to turnkey automatic cranes. Platformers World@CeMAT Lifting and access systems are core intralogistics technologies and therefore rightfully rank among the big highlights on display on the openair site at the upcoming CeMAT show. The Platformers World@CeMAT showcase will feature access platforms, mast climbers, telescopic forklifts, ladder hoists, mini crawler cranes, industrial cranes and more from a wide range of manufacturers. Manage & Service The Manage & Service showcase brings together internal and external logistics. It is staged in partnership with the “transport logistic” trade show and features exhibits by logistics services and planning and consulting firms. Digitalization is revolutionizing entire value chains and opening up new opportunities both for providers of internal logistics technology and for providers of external transport logistics services. The future success of these sorts of companies hinges on the efficiency and capabilities of their logistics centers. Big data is a case in point. Big data means that complete and up-to-the-minute information on vehicles, orders and consignments can be accessed anywhere, anytime, making logistics processes much simpler to manage and control. Pick & Pack The packaging technology lineup at CeMAT 2016 will be bigger and better than ever, thanks to a partnership between Deutsche Messe and easyfairs GmbH that will see easyfair’s “Empack” and “Label&Print” shows co-staged with Deutsche Messe’s Pick & Pack showcase. Among this year’s exhibits will be the very latest packaging plant and machinery, as well as state-of-the art transport packaging solutions, packaging materials and packaging media. CeMAT Deutsche Messe stages CeMAT events in the world’s most important markets, providing the intralogistics industry with superb platforms where it can present its products and innovations to buyers in the respective countries and regions. All CeMAT events are offshoots of the biennial CeMAT in Hannover, Germany, which is the world’s leading trade fair for intralogistics and supply chain management (next show: 31 May to 3 June 2016). CeMAT covers all sectors of the intralogistics industry, from innovative, energy-saving forklifts and industrial trucks and complex, fully automated conveyor systems to sophisticated rack and warehousing systems and the latest in control systems and logistics IT. Cranes, lifting equipment, aerial work platforms, Auto-ID systems, robotic logistics, and packaging technology for intralogistics round out the program. Deutsche Messe AG From its headquarters in Hannover, Germany, Deutsche Messe AG plans and stages leading capital goods trade fairs around the globe. The company ranks among the five biggest tradeshow organizers in Germany, with projected revenue of 335 million euros in 2015. The company’s event portfolio includes such world-leading events as CeBIT (digital business), HANNOVER MESSE (industrial technology), BIOTECHNICA/LABVOLUTION (biotechnology and lab technology), CeMAT (intralogistics and supply chain management), didacta (education), DOMOTEX (carpets and floor coverings), INTERSCHUTZ (fire prevention, disaster relief, rescue, safety and security), and LIGNA (woodworking, wood processing, forestry). With approx. 1,200 employees and a network of 66 representatives, subsidiaries and branch offices, Deutsche Messe is present in more than 100 countries worldwide.